"He is no fool who gives up what he cannot keep to gain what he cannot lose." 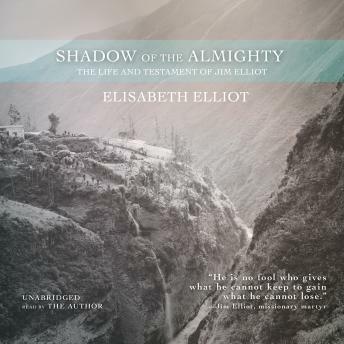 So wrote Jim Elliot at age 22, sweating over Greek roots and patristics at Wheaton College. "Seven years later," writes his widow Elisabeth, "he and four other young men...sat together on a strip of white sand on the Curaray River, deep in Ecuador's rain forest, waiting for the arrival of a group of men whom they loved, but had never met: savage Stone Age killers, men now known to all the world as Aucas." The circumstances of the death of these men are now known as one of the great missionary adventure stories of modern times. But this is the first account of the whole life of one of them, a life revealed in some of the most poignant and moving spiritual writings of our time. 'Shadow of the Almighty' is a tremendous biography of an adventurous and inspirational life.